As a result of heightened financial and food insecurity, populations adversely affected by HIV and/or AIDS may be more likely to utilise wild natural resources to supplement their diet and livelihoods. Should this effect be pronounced, HIV and AIDS may pose a serious environmental threat. We explored the hypothesis that the presence of factors in the household, such as chronic illness in and recent mortality of individuals in a high HIV-risk age group, as well as the fostering of orphans, are associated with increased utilisation of wild animal products (WAPs) at the household level. We randomly surveyed 519 households from four sites in rural South Africa, recording household socio-economic status, the utilisation of wild animal products and health and demographic factors attributed to HIV or AIDS. Binary logistic regressions were used to test if households with markers of HIV and/or AIDS affliction were more likely to have a higher incidence and frequency of WAP utilisation relative to non-afflicted households, after adjusting for socio-economic and demographic variables. We found that, although households with markers of HIV and/or AIDS were generally poorer and had higher dependency ratios, there was no evidence to support the hypothesis that WAP harvesting was associated with either poverty, or markers of HIV and/or AIDS affliction. Our findings suggest that generalisations about a possible interaction between HIV and/or AIDS and the environment may not uniformly apply to all categories of natural resources or to all user groups. With the AIDS pandemic now in its third decade of impact, studies which explore the impact of HIV and/or AIDS (HIV/AIDS from here onwards) on so-called 'development' issues such as food security, poverty and the environment are a priority.1,2,3 Accordingly, a growing body of literature has sought to explore how HIV/AIDS is impacting on issues such as national, community and household-level food security4; livelihood strategies5; and, increasingly, the environmental dimensions of HIV/AIDS.1,6 The relationship between HIV/AIDS, changing livelihood strategies and the utilisation of environmental resources has been highlighted as a major challenge facing the long-term management of HIV/AIDS, particularly amongst populations characterised by high levels of dependence on natural resources for fuel, sustenance and income generation.3,7,8 Despite these concerns, broad-based policy responses that seek to address the environmental dimensions of HIV/AIDS are on the whole poorly articulated and lack empirical content.1,6 Although national level HIV/AIDS policy responses, such as South Africa's National Strategic HIV/AIDS plan for 2007-2011,9 advocate for a broadly integrated approach, activities, outputs and outcomes are more overtly biomedical in focus. In this article we highlight these dynamics by means of a quantitative study of the association between HIV/AIDS and the use of natural resources in four sites in rural South Africa. 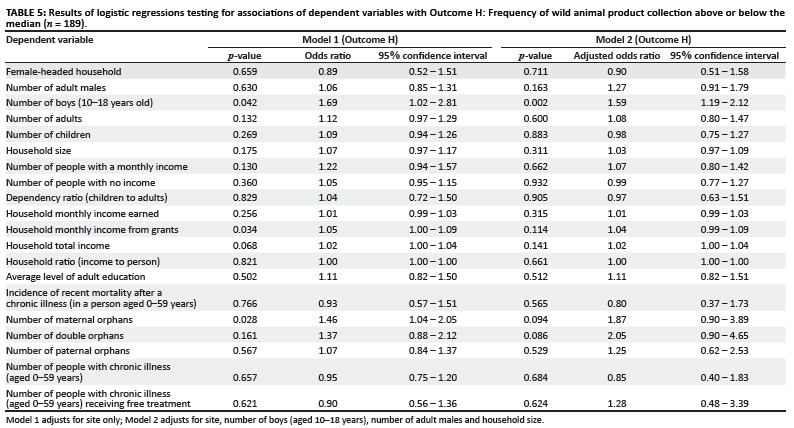 Given that natural resource use may vary considerably depending on the type of resource harvested,1 we limited our empirical study to the hypothesis that HIV/AIDS is associated with heightened use of wild animal products (WAPs) at the household level. To explore this hypothesis, we analysed cross-sectional household survey data to test for associations between the presence of HIV/AIDS-attributable proxies (such as chronic illness and mortality of someone in a high HIV-risk age group, as well as the fostering of orphans) and the utilisation of WAP at the household level. Whilst this narrow focus on a single natural resource category necessarily limits the scope of our findings, the selection of this particular natural resource was motivated by a lively theoretical literature around HIV/AIDS and WAPs, as well as a growing empirical evidence base to which we sought to contribute. These debates are reviewed in the section which follows. The relationship between poverty and heightened reliance on wild natural resources for food and income generation has been documented in a number of studies.25,31 Wild animal proteins such as coastal shellfish have been shown to serve as a kind of social security mechanism for the poorest households within a community.36 Yet our understanding as to whether drivers such as HIV/AIDS are affecting natural resource utilisation is still very poor - particularly in the South African context. For example, one study on households in the Limpopo Province suggested that households affected by recent adult mortality might rely more heavily on proximal natural resources to supplement diet and income following adult mortality,37 but subsequent quantitative research found that households impacted by the mortality of adults in their prime actually decreased their consumption of wild edible fruits and vegetables, which negatively impacted on household dietary diversity.8 Similarly, although households directly affected by HIV/AIDS may claim to have a higher experience of household food insecurity and cite a higher usage of wild edible vegetables than households that are not directly affected, these trends have been difficult to verify empirically at the household level.22 Household-level studies may also fail to capture heterogeneity of use at the individual level, particularly for vulnerable user groups such as children.26,27 In a recent study from the Eastern Cape, McGarry and Shackleton27 examined the diets of rural children and found that, although the majority (62%) of children supplemented their diets and traded in wild foods, children within households with high HIV/AIDS proxies tended to harvest higher quantities of wild marine and terrestrial protein over the short period of measurement. Overall, the literature to date suggests that, whilst a relationship between HIV/AIDS and the use of natural resources may well exist, the relationship may vary greatly depending on the type of natural resource utilised and the unit of analysis (household versus individual user categories). In building on this foregoing work, we aimed to explore the hypothesis that HIV/AIDS is associated with heightened harvesting of WAP through means of a cross-sectional survey of 519 households sampled in four rural sites in South Africa. Although the cross-sectional nature of the study makes it difficult to discern whether HIV/AIDS effects, should they be present, are as a result of changes over time, such an analysis does at the very least enable us to dispel some of the confusion that exists over whether the presence of HIV/AIDS-attributable factors in the household is associated with the use of a single, important natural resource at the household level. The research was conducted within four sites in South Africa, all of which were rural or semi-rural previously designated 'homeland' regions. Because the study involved sensitive issues relating to HIV/AIDS, actual names of the villages have been withheld in accordance with the ethical clauses in the research protocol. The sites were: (1) a cluster of settlements within 15 km of the town of Mt Frere in the Eastern Cape Province, (2) a settlement 20 km from the town of Nkandla in the Nkandla District, KwaZulu-Natal, (3) a cluster of settlements in the KwaDlangezwa region of Zululand, KwaZulu-Natal, about 20 km from the city of Empangeni and (4) a village in the Msunduzi District near Pietermaritzburg, within 20 km of the town of Mpophomeni. Selection criteria for sites included: (1) land held under communal tenure with natural resources subject to communal access, (2) having both high district level HIV and AIDS prevalence and (3) having high levels of poverty. Table 1 shows a breakdown of the mean household socio-economic and HIV/AIDS characteristics of the households sampled. It should be noted that none of the sites were bordering on or in close proximity to conservation or protected wildlife areas. Aerial photographs were used to delineate a study area of approximately 500 households. Within this demarcated study area, a random starting point was selected and thereafter every fourth household was approached until a minimum of 125 households was sampled. In Nkandla, 175 households were sampled after expanding the sampling frame appropriately. After data cleaning, a total of 519 households was available for analysis: 126 from Mt Frere, 176 from Nkandla, 110 from KwaDlangezwa and 107 from Msunduzi. All participants gave informed consent prior to answering the survey questions. Earlier piloting by means of focus group discussions indicated that the use of WAPs was widespread amongst young boys (usually aged 10-18 years) and older men for recreation and domestic consumption, and to a lesser extent for trade and traditional medicine. In keeping with indications from the literature,33,34,35 focus group discussions confirmed that, in all the sites, rodents, small antelope species and small carnivorous mammals were the most common quarry. Collection activities by older men were primarily accomplished through pursuit of prey by hunting with dogs, although the use of snares and traps was not uncommon. For young men and boys, collection activities were less discerning, and tended to focus more on smaller-bodied animals, such as small rodents and wild birds. Even very small quarry were consumed, and marketable parts were traded locally wherever possible. For each household, the respondent was asked whether any household members ever harvested WAPs. The frequency with which these activities occurred was estimated given six potential frequency response categories. Aquatic species and shellfish were excluded because not all sites were within range of rivers, dams or the coast. The household survey questionnaire also probed in considerable detail the types of WAP resources most frequently harvested, their utility and the demographics of specific harvesters. As HIV and AIDS incidence or prevalence can only truly be determined clinically and at the individual level, studies that deal with the household-level impacts of HIV and AIDS need to address the problem of how to gauge by proxy the presence of HIV and AIDS in the household. Usually, the primary variables that indicate a demographic composition known to be associated with the presence of HIV or AIDS in the household are used. This approach has been widely applied to household-level studies that address the association between HIV/AIDS and socio-economic,38 livelihood, food security21,39 and environmental phenomena.21,22,26,37,39 After Madlala et al.40, the following household-level HIV/AIDS proxies were used in this study: (A) a recent (< 24 months) death in the household of someone between the ages of 0 and 59 years preceded by a chronic (> 3 months) illness, (B) children in the household aged 0-18 years with a deceased mother, (C) children in the household aged 0-18 years with both parents deceased, (D) children in the household aged 0-18 years with a deceased father, (E) a person in the household aged 0-59 years with a chronic illness and (F) a person in the household with a chronic illness receiving free treatment. Although the household survey probed in some detail animal types harvested, the demographics of the harvester and the intended utility of the harvested product, very few households (< 5%) reported harvesting WAPs for trade or medicinal purposes, even though exploratory qualitative work had suggested that the use of WAPs for trade and medicinal purposes was locally quite high. This discrepancy may be as a result of the sensitivity of the subject, or because of a fear of stigmatisation. As a result, it was not possible to further disaggregate the analysis by resource utilisation category (i.e. trade, medicine, consumption or recreation). Moreover, although some basic aggregation into resource type at the level of taxa was possible, sensitivity analyses performed using multiple WAP harvesting outcomes rendered very similar findings to aggregate analyses where all taxa were collapsed into a single category. Consequently, for the purposes of analysis, this study aggregated all WAP collection activities into two binary outcomes for incidence (yes or no) and frequency (above or below the median) of WAP harvesting in the household. In like fashion, HIV/AIDS proxies were categorised into binary variables (the presence or absence of the proxy within the household). HIV/AIDS outcomes were (A) recent mortality of a person with chronic illness aged 0-59 years, (B) fostering of maternal orphans, (C) fostering of double orphans, (D) fostering of paternal orphans, (E) chronic illness in a person aged 0-59 years and (F) a chronic illness in a person aged 0-59 years receiving free treatment. WAP harvesting outcomes were (G) the incidence of wild meat collection activities within the household and (H) the frequency of hunting activities. The binary, categorical nature of both the WAP and HIV/AIDS outcomes in this study meant that generalised linear regression models were inappropriate for analysis. As an alternative, logistic regressions were useful because they do not require that the continuous independent variables are normally distributed, and predictor variables can be categorical or continuous. Using multivariate logistic regression models, six potential HIV/AIDS proxy outcomes and two potential WAP harvesting outcomes were tested for statistical association with dependent variables. Two multivariate logistic regression models were used in the analysis of all outcomes. Firstly, a main-effects model examined the association between the likelihood of a household having a particular outcome (A-H) and the dependent variables relating to household socio-economic status and demographic status, whilst adjusting for site alone (Model 1). A second model then made adjustments for site and potential socio-economic status confounders (Model 2). 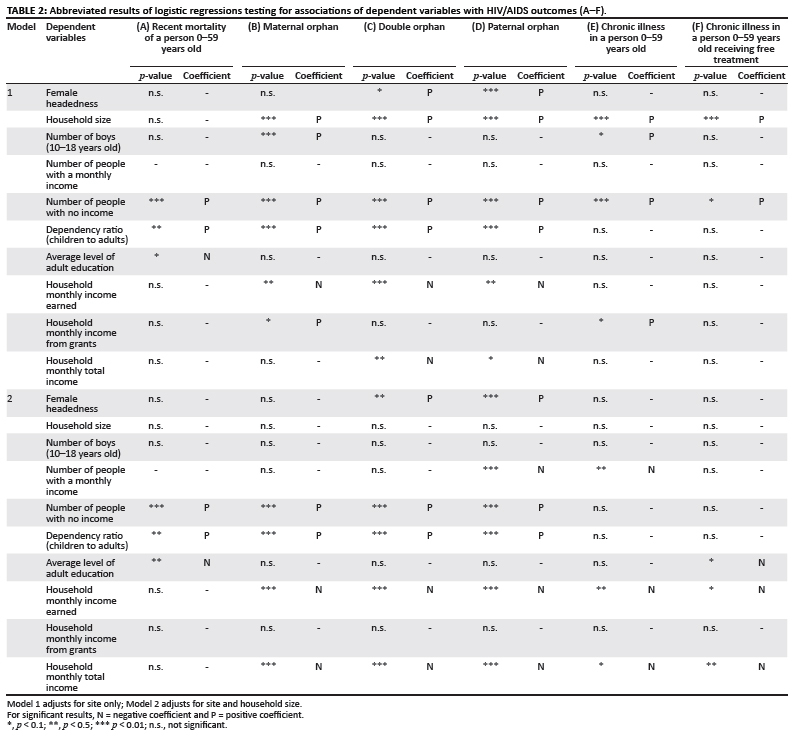 Main-effects models adjusting only for site indicated that a number of dependent variables were associated with the likelihood of a household having HIV/AIDS proxies (Model 1, Outcomes A-F, Table 2). Notably, having more dependent variables was positively associated with a higher chance of having had a recent mortality and chronic illness in a person aged 0-59 years. The presence of single and double orphans in the house was also associated with lower household income. As the odds of detecting orphan fostering and chronic illness were also higher in larger households, a subsequent model (Model 2, Outcomes A-F, Table 2) controlled for both site and household size. The results of these analyses show that, even when adjusting for potential demographic confounders, households with a lower socio-economic status and a higher number of dependants were more likely to have experienced the recent mortality of someone aged 0-59 years. Similarly, households fostering single and double parent orphans were more likely to have higher dependency ratios (i.e. a higher ratio of the number of children to adults) and lower incomes. Households with paternal and double orphans were more likely to be female-headed. In addition, households with a person aged 0-59 years with a chronic illness were significantly more likely to report lower household incomes, but only if the chronically ill person was receiving free treatment. Overall, the results of these analyses suggest that household HIV/AIDS proxies are more prevalent in households with lower socio-economic status and higher dependency ratios. Of the 519 households surveyed, 40.6% (210 households) had collected WAPs within the last year. Of these collecting households, about half (49.2%) did so on at least a monthly basis (Table 3). Binary logistic regressions were used to assess whether WAP collection outcomes were more likely in households with particular socio-economic and HIV/AIDS characteristics. Although main-effects models, which adjusted for site alone, initially showed that households with a higher income from social welfare grants were more likely to be engaging in WAP collection activities (Model 1, Outcome G, Table 4), this effect failed to maintain significance in subsequent models which adjusted for the number of male individuals in the household (Model 2, Outcome G, Table 4). Grant income was thus excluded as a confounder in subsequent adjusted models. Household demographics, specifically the number of male children (10-18 years old) and adult males (> 18 years old) in the household, were the only variables that maintained significance with WAP collection in the adjusted model (Model 2, Outcome G, Table 4). The association between HIV/AIDS proxies and the likelihood of a household reporting WAP collection was also explored using main-effects and adjusted models. Although the number of people between the ages of 0 and 59 years with a chronic illness was associated with higher odds of reporting WAP use in main-effects models (Model 1, Outcome G, Table 4), subsequent adjustments for household size rendered this HIV/AIDS proxy non-significant (Model 2, Outcome G, Table 4). In contrast, number of paternal orphans in the household, which was a significant main effect in simple models that controlled for site only, still maintained significance when potential confounders such as number of boys (10-18 years old) in the household, number of adult males in the household, and overall household size were adjusted for. This significance was maintained during further sensitivity analyses which also adjusted for household economic status and incidence of female headedness (analyses not shown). This may be because paternal orphans, who are more likely to have grown up in a household without a male parental figure, are less able or inclined to collect WAPs. Holding the number of adult and adolescent males in the household constant, for every additional paternal orphan in the household the odds of a household reporting WAP collection activities decreased by 39% (p = 0.021, adjusted odds ratio = 0.61 [0.4-0.93]). 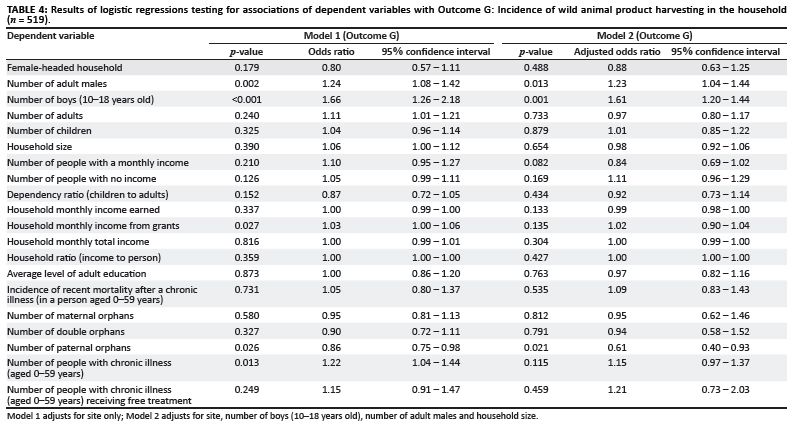 Of the households that engaged in WAP collection activities, households with a higher number of adolescent and teenage boys (10-18 years old) had a higher likelihood of having a high collection frequency in both main-effects and adjusted models (Models 1 and 2, Outcome H, Table 5). In main-effects models, total household income and welfare grant derived income showed a significant negative association with hunting frequency, but failed to maintain significance when adjusting for household demographics. With respect to the association between HIV/AIDS proxies and WAP collection frequency, the number of maternal orphans in the household was significantly associated with WAP collection frequency in main-effects models (Model 1, Outcome H, Table 5), but failed to maintain significance after adjusting for significant demographic covariates (Model 2, Outcome H, Table 5). However, the number of double orphans in the household did become significant with WAP collection frequency at the 10% level in adjusted models(p = 0.086, AOR = 2.05 [0.9-4.65]). The tendency of HIV/AIDS to heighten household dependency ratios and worsen household socio-economic status over time has been well documented in both South African38,41,42,43,44 and global contexts.45,46 The relationship between household HIV/AIDS proxies and socio-economic status observed in this study was, therefore, in keeping with the theory that HIV/AIDS and poverty are mutually reinforcing. As it were, however, this study failed to find an association between household socio-economic status and collection of WAPs, and in turn found no support for the hypothesis that HIV/AIDS is associated with heightened use of this particular natural resource at the household level. If anything, the opposite was implied. For example, households with paternal orphans were less likely to participate in WAP harvesting activities than households without paternal orphans, even when adjusting for potential confounders such as the number of adult males in the household. When these findings are considered in the context of the literature, it is becoming increasingly apparent that household HIV/AIDS responses are not necessarily consistent across HIV/AIDS affliction categories (mortality, morbidity and orphan fostering) and natural resource types. For example, whereas households with prime-aged adults with chronic illness have been observed to harvest relatively lower amounts of natural resources (including WAPs,23 wild leafy vegetables22 and fuelwood10), households with prime-aged adult mortality and orphan fostering may be more likely to exert increased harvesting pressure on natural resources such as fuelwood,7,8 and grass and reed products,18 for which local markets often exist. Variations in the type (positive or negative) of association across HIV/AIDS affliction categories may be attributable to temporal patterns in HIV/AIDS responses that are otherwise obscured by the cross-sectional nature of the research. Households in the early stages of HIV/AIDS affliction, for example, may be more likely to include an adult of prime age with a chronic illness. The presence of such a chronically ill person may in turn result in the diversion of the remaining household labour to care for this person, with both factors contributing to a shortage of household labour. Household labour deficits, coupled with the loss of income and the household fragmentation that may accompany illness, could in the short term curtail natural resource collection activities. In the long term, however, prime-age adult mortality and an increased number of orphan dependants in the household might result in households investing more heavily in the collection and trade of marketable natural resources. In our study, WAP harvesting was not constrained in the presence of an adult of prime age with a chronic illness, nor was it augmented after a mortality of an adult of prime age. Although further work is certainly needed in order to clarify the reasons for these trends, a number of possible explanations should be considered. Firstly, the reason why chronic illness was not associated with a curtailment of WAP harvesting may be because women are the household members who often shoulder the burden of care in HIV/AIDS contexts.47 In our study sites, women were not significantly involved in the collection of WAPs. Chronic illness in adults of prime age is thus unlikely to curtail WAP harvesting in the same way it would the harvesting of natural resources that are predominantly collected by women, such as fuelwood10 or wild vegetables.22 In addition, WAPs were not widely traded in the study areas and had little income-generating potential. As a result, they are unlikely to be used to ameliorate the effects of income loss and additional dependant fostering, as has been suggested for more lucrative natural resources such as fuelwood8,10 and weaving reeds and grasses.18 Rather, in this study, it was paternal orphanhood that was associated with diminished harvesting pressure. Initially, we hypothesised that this association may be as a result of the likelihood that paternal orphan households have fewer adult males, and are therefore likely to harvest fewer WAPs. However, as this association was still significant when adjusting for the number of male individuals in the household, alternative hypotheses should be considered. It is possible that loss of intergenerational knowledge on WAP harvesting, which is presumably passed between father and son, is the reason why the surviving male members of households with deceased adult males are less likely to harvest WAPs. More research is certainly needed to explore this hypothesis more fully. Secondly, in the current study, the aggregation of response categories for WAP utility (trade, consumption, recreation and medicinal) was an unfortunate (albeit necessary) limitation to more nuanced observations about the role played by HIV/AIDS in driving demand for different WAP user categories. Trade in natural resources for medicinal purposes is a particularly interesting phenomenon for which HIV/AIDS is believed to be markedly increasing the demand.7,15,16,17,48 However, the sensitive nature of traditional medicine trade and harvesting, coupled with a rarity of this activity at the population level, limited the ability of this study to probe these dynamics in more detail. More targeted studies that address this specific phenomenon should be the subject of future research. Thirdly, this study raises the important question of site specificity. Exploratory analyses on village-level data failed to detect significant site-level effects, and data were pooled to enhance statistical power. The study is thus limited in its ability to comment on site-specific effects. A larger sample might be needed to comment on site-level effects in future studies. Site-level analyses are important, because afflicted individual households may indeed not be utilising significantly higher levels of natural resources relative to non-afflicted households, whereas whole regions, villages, biomes or communities may be experiencing localised changes in natural resource use that could, in cluster level analyses, be attributable to regional HIV/AIDS prevalence or local environmental conditions. In the drive to describe the long-term impacts of HIV/AIDS on development issues, the environmental dimensions of HIV/AIDS have been justly flagged for urgent attention. However, whilst this study reveals some inadequacies in the theoretical arguments on WAP and natural resource use in HIV/AIDS contexts, it also indicates that we still have limited knowledge of the dynamics and interrelationships driving this relationship. Whilst the hypothesis that HIV/AIDS leads to heightened use of natural resources may well hold for certain natural resources, or certain HIV/AIDS proxies (mortality, morbidity and orphan fostering), and at certain scales (individual, household or community), the growing body of evidence has emphasised the need for research to be sufficiently explicit about the unit at which analysis is directed, the type of natural resource that is being utilised, and the extent to which feedbacks between specific markers of HIV/AIDS affliction and natural resource utilisation are moderating need. On the whole, this study highlights the poor articulation of environmental issues in HIV/AIDS policy. Failure on the part of this study, as well as others, to confirm received wisdom to date with regard to HIV/AIDS and natural resource management, provides a strong basis for more substantive incorporation of the matter in environmental management policies as well as the next national HIV/AIDS plan. A more substantive review of the relationship between HIV/AIDS and the environment should consider potential feedbacks between an increased need for natural resources as a result of AIDS-aggravated poverty and food insecurity on the one hand, and curtailment of resources, such as household labour, income, and social and human capital, on the other hand. Policymakers should also be aware that interpretation of HIV/AIDS relationships may be complicated by the presence of underlying temporal patterns that fail to be captured because of the use of cross-sectional data sets, and that effects may vary significantly from site to site as well as between natural resources. Uniform calls for conservation authorities and policymakers to heighten wildlife protection activities in the wake of HIV/AIDS should be interpreted with caution, and with a full understanding of the limits of our current knowledge of these dynamics. Such generalisations may not uniformly apply to all categories of natural resources or to all user groups. This research was funded by a grant from the Rockefeller Brothers Fund. We gratefully acknowledge their support. S.A. Kaschula was responsible for the specific study design, original data collection, data cleaning and analysis and for writing the article. C.M. Shackleton was responsible for the formulation of the original research hypothesis, fundraising, supervision of the study, data analysis and co-authorship of the final article.